Transform your thinning hair into full head of hair in just 30 seconds! 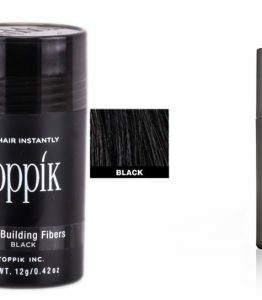 Toppik Hair Building Fibers instantly make thinning hair look thick and full. It’s Keratin fibers cling to existing hair and in seconds fill in all thinning or balding area. Toppik won’t come off in wind, rain or perspiration. It is totally undetectable, even from as close as two inches. All you will see is thicker looking hair! 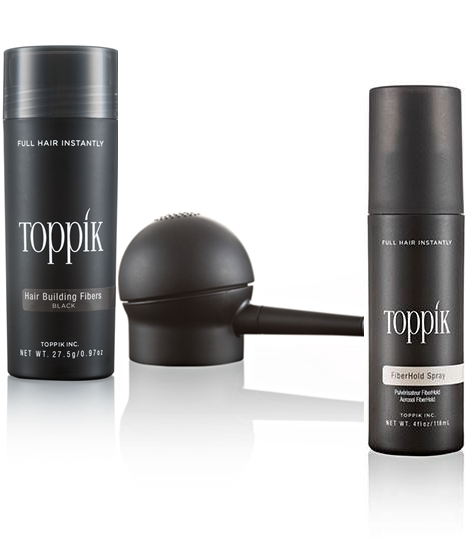 With the uses of toppik fiberhold spray, your hair will look more natural, stay on longer ! Try our value pack right now! Toppik Hair Building Fiber uses something known as “micro-fibers” which, when applied, bind to your hair, making it look thicker. The fibers used by Toppik are made of the same protein Keratin that normal human hair is made up of. The fibers actually mesh with your hair so well that it’s nearly impossible to tell the you’ve done anything. Instantly you will see a more natual, thicker looking head of hair in just 30 second ! NO MORE HAIR LOSS ! Towel or blow-dry your hair, or allow it to air-dry completely. Toppik hair building fiber should be used only on dry hair.Hold the Toppik container 2-3 inches above the areas to be thickened. For targeting small spots, you may bring the container right up to the area.Shake Toppik liberally over desired areas with the bottle opening facing completely downward. Don’t worry about any fibers falling into surrounding hair, since they will simply disappear.If you cannot see your back-of-the-head area in the mirror during application, use your other hand to guide you to the areas to be enhanced. If necessary, apply Toppik with your head down, and look in the mirror afterwards. Fill in further as needed. You will soon learn to apply Toppik effectively with only an occasional glance at the mirror or with no mirror at all.In frontal areas, spread your thumb and forefinger and place your hand on the top of the forehead below the hairline to keep stray fibers from falling onto forehead and eyes. Better yet, use the new Toppik Hairline Optimizer. See below for details.Pat your hair to disperse Toppik hair building fiber throughout the area. Use an open, plastic, non-bristle brush or any comb to style your hair as you wish. You will notice that your hair is much easier to style with the added bulk of the Toppik fibers.If coverage is not complete, add more Toppik and pat or brush until your hair looks thick and full.